Everything is bolting: lettuce, kale, turnips, cabbage, and the broccoli. In years past these plants would have already been removed from my garden before they got to this stage, but the tomatoes were slow to start this year, so I let them be to do their thing. There is something reassuring about watching these vegetables each make their effort to produce seed, like they would be fine without me. 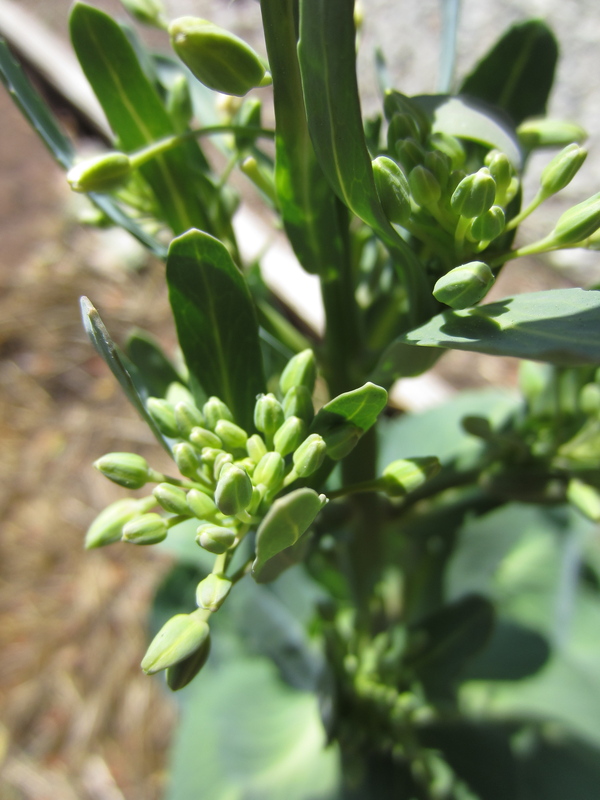 I contemplated leaving in a single broccoli plant and collecting its seeds. 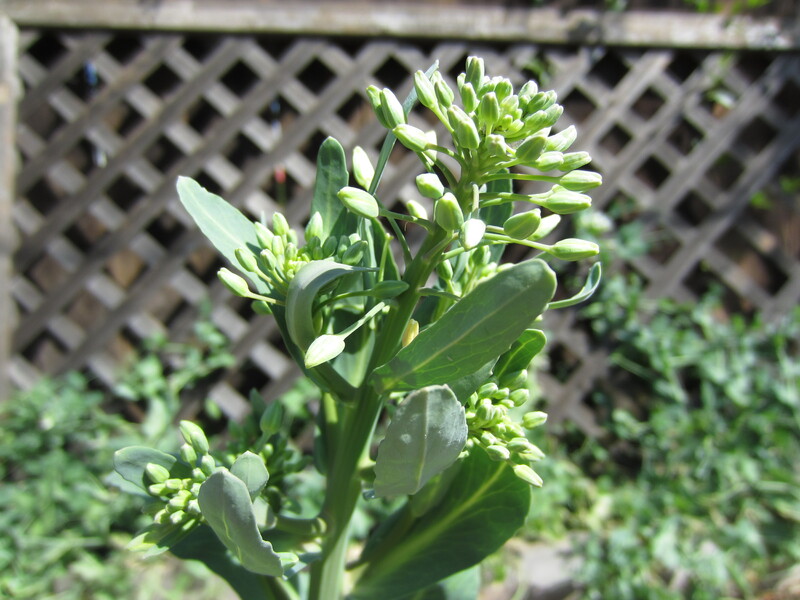 All of my Brassicas bloomed at different times, so there was no fear of cross-pollination. But, I could see the aphids taking over and discovered I would need a few more months for mature seeds, and decided it was time to pluck out the winter crops and replace them with warm season delights. Like the change of seasons from summer to fall, this is a do or don’t time of year for me. While I let the last of the cool season crops feed us for a few more weeks, I get anxious to replace them with beans, peppers, tomatoes, cucumbers, and squash. It is a practice of knowing when and of patience. It is a dance. I want to pull, pull, pull thinking it will be too late to sink in those heat lovers. But, then I have to take a deep breath and remind myself that the growing season is long. I have through October. I take another deep breath and enjoy the last few peas, the last few leaves of kale, will the garlic stocks to get just a little bit fatter, and smell the sweet pea flowers. In just a few short weeks these things will be just memories to hold until the cool weather returns. Beautifully described, the urge to pull, pull, pull ! 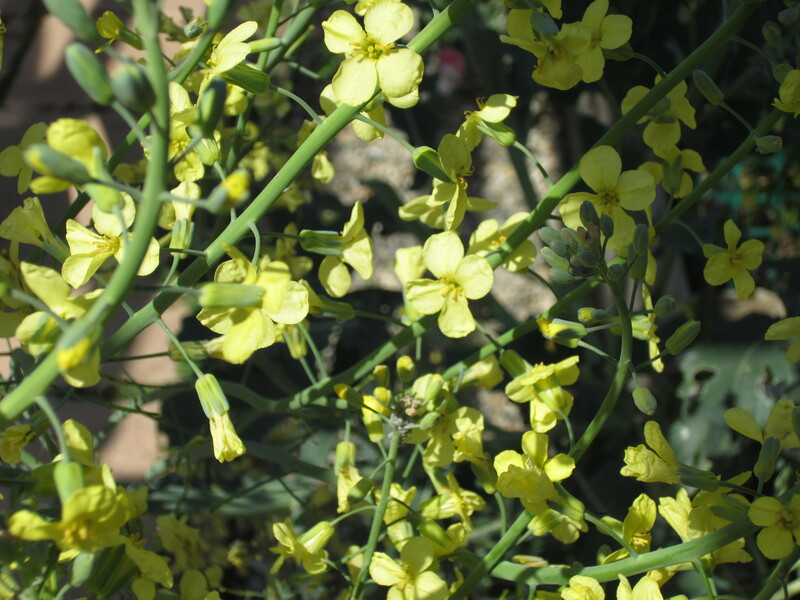 to slow down a little and see some of the seeds – I love the brassica flowers and so do the pollinators! Indeed they do! Bees in the garden make me smile :). I also just like knowing what the plant looks like all the way through. I can totally relate! I feel the same way every year. It won’t be long now. Last year I challenged myself to leave the Cosmo seeds alone (for the birds) and resisted my natural urge to yank it out when it started to die back. I’m glad I waited…it was a new experience. Yay! And you may find yourself with a whole mess of cosmos this year. My calendula just keeps spreading and spreading. Flowers are great reseeders. Enjoy the cosmos. Maybe I should plant some and do the same. I made a photo card last year of all my Cosmo photos, then gave them as gifts with some of the seeds I collected at the end of the season. Now several of my friends are planting them this year too. Isn’t that fun? I hope they do pop up again. I’ve planted more to hedge my bets, the ones I harvested and a few packets in different colors. Let me know if you plant some, too. Isn’t it interesting how the aphids descend upon the brassicas when it is time to pull them? The leaves on my bolted kale still taste OK, however, I am tired of meticulously cleaning the aphids off of them. The weekend the kale is coming out and the beans are going in! I think pests can sense weakness in plants. I grew cabbages in several places in my yard this winter, and the ones in the better soil faired much better. The caterpillars didn’t touch them. Those in the poorer soil were very prone to being eaten by critters. Very interesting, indeed!